Over the past few years many farmers have taken the initiative to diversify out of traditional crops - and in the era of Single Farm Payments this path is becoming a necessity for many, many more. Not everyone wants to get involved in tourism or other non-farming activities, but it can be difficult to find a novel crop suited to UK conditions and with a worthwhile return in the long term. Walnuts are, however, an excellent choice. After the initial set-up costs they need little input, and start producing useful returns within ten years - returns which increase very considerably throughout the following decade and continue for a lifetime. Being easy to grow organically, in strong demand and simple to manage they provide a low-input, high-yield investment independent of official subsidy. It is possible to continue using fields for pasture after conversion to orchards: suitable fencing for sheep around each tree still leaves 90% of the field area available, and even protection against cattle will reduce pasturage by less than a quarter. 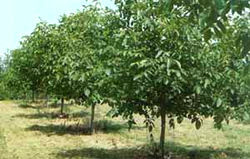 Our retail pricing gives an idea of establishment costs, though there are both discounts for large orders of the main varieties and a special scheme using smaller trees than usual. This scheme trades initial cost against the likelihood of a few more failures, as we won't have had as long to spot the weaker specimens. We offer advice and consultancy to farmers and other landowners interested in putting their fields to new use, and are happy to arrange site visits and planning sessions. Call us on 01558 669043 or send an email to info@graftedwalnuts.co.uk for more information.